It's the final stretch! Tigers are playing full out in fundraising this year! For Friday's popsicle distribution, 100 students have reached/passed the $100 threshold. * Special collection THURSDAY Oct 5 8:25am for popsicle distribution that day. * Final collection Fri Oct 6 8:25am for contest & prize winners. NEW Movie Screening at school in the Multi-Purpose Room for all students, if we collectively raise more than last year's record $77,774 by Oct 6th 8:25am PT. Click for Official Contest & Prize List. All students receive a T-shirt and pizza lunch! * Students may opt out of receiving a prize. This is very generous of the student as Teach Boosters can save and repurpose the funds toward school programs. * Prize levels are PER child so siblings in same household cannot combine to reach a prize level. 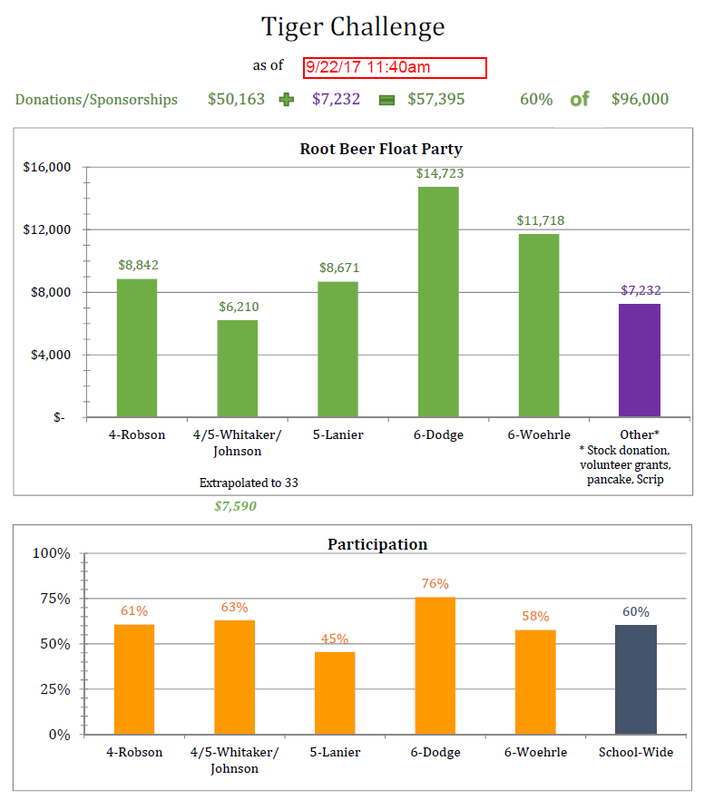 * Business sponsorships count toward prize level this year. * Corporate matches count if check or electronic funds transfer is received by Oct 6th 8:25am PT. * All donations (cash/check/online), including your Tiger Support donation/installment, must be received by Oct 6th 8:25am PT to count for contests. goes to home room with the highest donations raised. goes to top earner of the entire school. goes to top earner of each homeroom. Two weeks are in. Two weeks are left. We're at the halfway point and our version of the House Cup standings shows that Dodge's home room is in the lead. $50,163 raised in the classes + other fundraisers = $57,395 for thermometer! 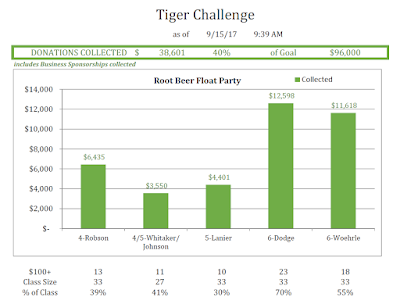 We're so proud that 60% of the students are participating in the Tiger Challenge fundraiser! Of the 96 students participating, 91 have crossed the $100+ popsicle threshold. * See below for FAQs. * Set your goal (and prize level). * Make a plan... and go for it! * Turn in collections every Friday. * Next Tiger Tally is Fri Sep 29 8:25am PST! The Field Day Games Are Set! Is the popsicle list for incremental $100 every week? 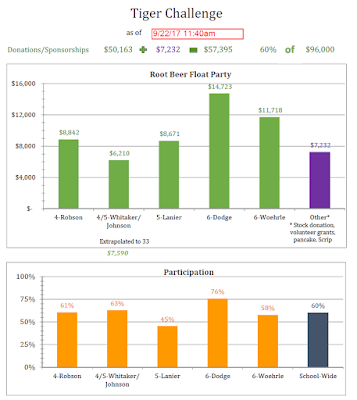 How do I know how much my student has received from online donations? When the students turn in their pledge envelopes on Friday, we write these in. If you wish for the information sooner, please contact Booster Treasurer. I have a business sponsorship, but the deadline passed. What should I do? Our deadline was early in order to receive T-shirts and banners with business logos in time for Oct 6 Tiger Challenge. If the business is ok with missing the T-shirt opportunity and just receiving its banner (if applicable) after Oct 6, then we'll gladly accept its sponsorship support, display its banner through July, and post its name/logo on TeachBoosters.org (with hyperlinks to the business homepage), Teach Booster Facebook, school newsletter, directory and yearbook. Tiger Tally - Week 1 - Paws Up! Wow! 75 students have turned in $100+ as of Fri 9/15 morning and earned a popsicle to kick off the weekend! Mrs. Dodge's class is leading the Root Beer Float Contest, but Mrs. Woehrle's class is right behind. The other classes have an opportunity to catch up -- and even surpass -- the 6th grade classes while they are on their incredible adventure at Catalina Island Marine Institute! Keep your eye on the prize... which is the AMAZING experience at CIMI (6th) next week, Camp Ocean Pines (4th) in Nov and Yosemite (5th) in Jan. It is such a rare and truly special opportunity for our students! Of course, there are also these great contests and prizes! Note: Tue Sep 19 is a special collection day as it is the deadline for Business Sponsors (payment, logo and/or banner artwork to sponsorchair@teachboosters.org) or online with 2.5% handling. If we do not receive the high resolution logo/banner artwork by Tue Sep 19 9pm, then the business sponsor will not be on the T-shirt and the banner may not be displayed in time for Tiger Challenge day. Tiger Tally is next Fri Sep 22 8:25am PST! Try out entrepreneurial ideas - lemonade stand sales, garage sales and more! Reach out to your extended family, neighbors and businesses. 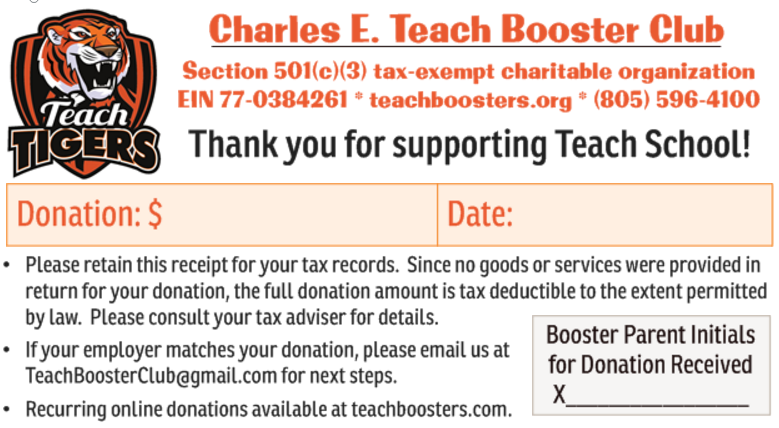 Donations can be made by checks to TEACH BOOSTERS, cash or online (please use/share this link (versus Go Fund Me) for donations to count as tax deductible). Go TIGERS! Contact us for any questions! This year's Tiger Challenge will be on October 6th! This exciting event combines fundraising and a Tiger Challenge Field Day which promotes fitness, teamwork and fun. 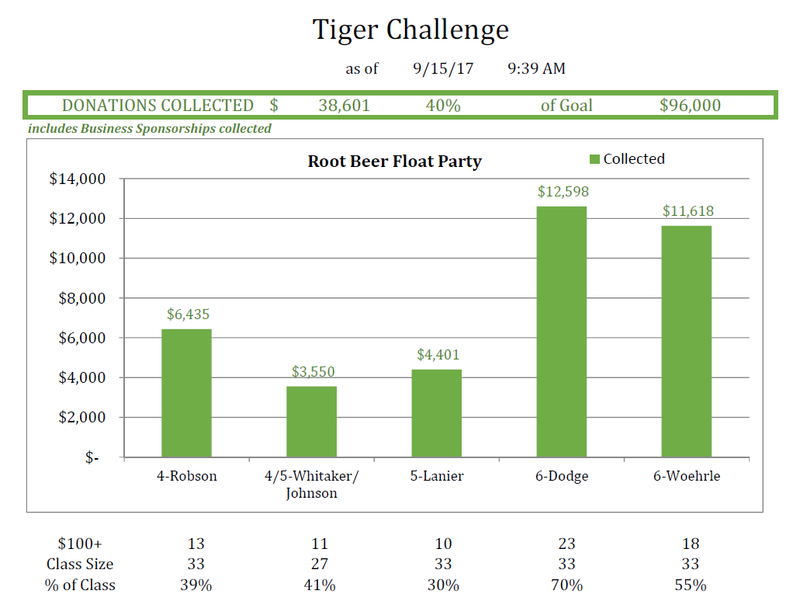 Students earn prizes in the competition by obtaining donors or business sponsors and participating in the Tiger Challenge Field Day activities. All Teach students receive a Teach Tiger Challenge T-shirt and pizza lunch! Guests of students can order pizza lunch see below. 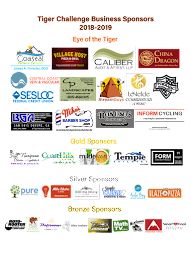 Sponsorships offer high visibility to your business to both Teach Elementary School families and the greater San Luis Obispo community. 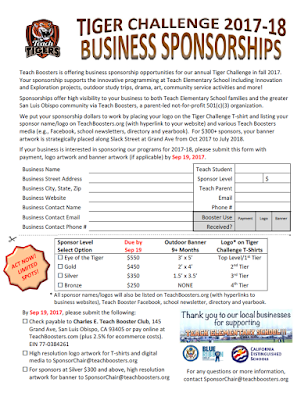 Business Sponsor logos appear on Teach Tiger Challenge T-shirt and at $350+ on banners strategically placed along Slack Street at Grand Ave from Oct 2017 to July 2018. All business sponsor names/logos will also be posted on this website with hyperlinks to business home pages, Teach Booster Facebook, school newsletter, directory and yearbook. 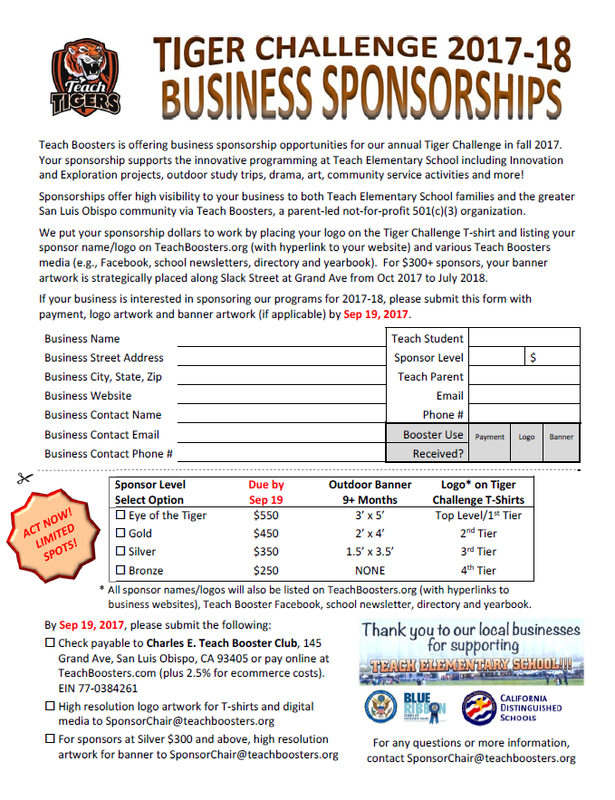 Business Sponsors must complete form, submit logo and/or banner artwork to sponsorchair@teachboosters.org and make checks payable to Teach Boosters, 145 Grand Ave, San Luis Obispo, CA 93405 or online with 2.5% handling to cover ecommerce costs by Sep 19th 9pm PST. 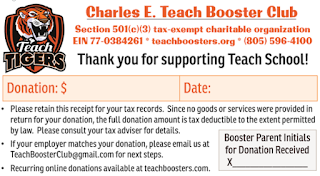 All donations are tax deductible as Charles E. Teach Booster Club ("Teach Boosters") is a 501(c)(3) not-for-profit with Tax ID# is 77-0384261. We gratefully accept checks payable to Teach Boosters, 145 Grand Ave, San Luis Obispo, CA 93405 and online donations with 2.5% handling to cover ecommerce costs. Please note the Teach student you are sponsoring! If your donation is eligible for corporate matching, please contact teachboosterclub@gmail.com for next steps. The corporate matching check or electronic funds transfer must be received by Oct 6 8:25am PST to count for prizes. 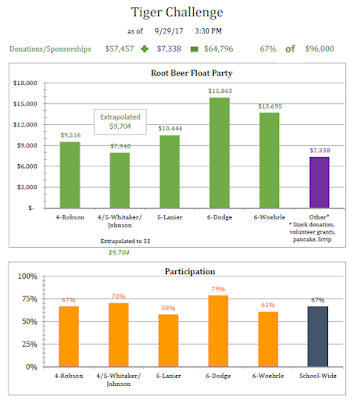 The class with the most donations wins a Root Beer Float Party. The top earner of the entire school gets to be Principal for the Day. The top earner in each class gets to be Teacher for the Day. • Students may opt out of receiving a prize. • Prize levels are PER child (so siblings in same household can't combine to reach a threshold). • Business sponsorships count toward prize level (deadline for business sponsorships is Sep 19th). • Corporate matches count if check or electronic funds transfer is received by Oct 6th 8:25am PT. • All donations (cash/check/online), including your Tiger Support donation, must be received by Oct 6th 8:25am PT to count for contests. Come celebrate the fun and sportmanship with Teach students during the Teach Challenge closing ceremonies on Oct 6th! Guests of students (parents, grandparents, neighbors) may pre-order purchase pizza lunch at $5 each online or $6 each on the day of. Please contact us for any questions at SponsorChair@teachboosters.org!